Claire McCaskill, the former U.S. 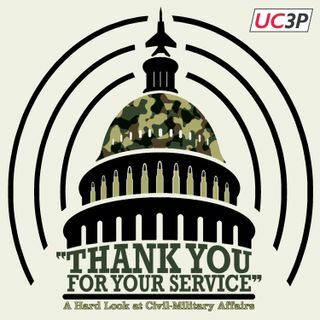 Senator from Missouri, joins the podcast for a wide-ranging discussion of her twelve years as a member of the Senate Armed Services Committee. We talked about oversight of defense contracting, the military-industrial complex, sexual assault reform, military justice, and congressional debate over the Authorization for Use of Military Force (AUMF). Haliburton, the F-35, New Balance shoes, Kirsten Gillibrand, Saudi Arabia, ice cream flavors, and Boeing may or may ... Más informaciones not have been mentioned as well. This episode was taped at the Harris School of Public Policy while Senator McCaskill was serving as a visiting fellow at the University of Chicago Institute of Politics. Warning: The following episode contains explicit language. And as always, this podcast is absolutely not in any way intended to reflect the official positions of the Department of Defense or any other military entity. Note: Four active-duty military officers & Harris students were in the room when we recorded this episode, including Thomas & Nick. Senator McCaskill’s frequent “you’s” and “you all’s” during this interview were directed towards them. Special thanks to Ellie Price, Cindy Hall, and the University of Chicago Institute of Politics.